Andrew Gilligan does not like builders. It’s fine to have prejudices, but does that warrant being given an hour of prime time Channel 4 Dispatches to conduct a personal hatchet job on them? On the one hand, it’s good to have well-known faces like Gilligan getting to grips with the serpent that is the UK housing scene: on the other, it would be refreshing to have a guide without such an obvious axe to grind, one who is prepared to give a little airtime over to the housebuilders to defend themselves. Whilst it seems relatively easy for career journalists to get the opportunity to make programmes for the likes of Dispatches, I have yet to see anything on terrestrial TV that shows how life is on the other side of the trenches. Gilligan certainly didn’t pull any punches. He started with a stiff jab to the mid-riff: he took Stephen Nancarrow, of Inspector Home, with him around a Bryant estate and literally pulled it to bits. It made for good knock-about TV, but Nancarrow admitted it was possibly the worst example of finishing that he had come across. As it is his job to uncover sloppy finishing, it did rather rather smack of being a fit-up. Presumably 99.9% of new homes are better than these, but that of course didn’t get mentioned. Instead the NHBC got lampooned for passing these admittedly shoddy homes. Then it was the turn of Greenwich Millennium Village and the problems some of the residents have had with noise issues between flats. Whilst it was conceived as an exemplar development, it is often forgotten that it was built to the pre-2003 Part E noise standards. As was pointed out by the NHBC in the builders defence, the development met the regs in force at the time, it was just that the regs were inadequate. Who is culpable for that? The builders? The NHBC? Or the government? For Gilligan, there was no question. It had to be those big, greedy developers and their tame lackeys in the NHBC. Me? I’m not so sure. Not that the government got off scot free. There was the obligatory laugh at John Prescott who was shown showing off his £60,000 house. Gilligan nipped up to Allerton Bywater in Yorkshire to find that they were for there, for sale, for a minimum price of £225,000. QED: Prescott’s an idiot. Strange for me to be riding to his defence, but not even John Prescott ever thought that a house that cost £60k to build would sell for £60k. The restless Gilligan then rode on to dig up some underhand dealings by St George in Fulham. To help get their Imperial Wharf development up and running, a PR firm was hired to fake letters of support to local councillors. Even worse was afoot in Manchester, where a lobby group, Media Strategy, was hired to help lower the affordable housing targets set by the North West plan. And some accusations of bribery were re-aired against developers gifting money to the Labour Party: apparently you can get away with this as long as the gifts are not to individuals. What struck me was how small the amounts involved were. £5,000 to get to develop a casino site? You’d lose that much on a good night at the tables. Gilligan’s implication was that the whole development scene was corrupt from top to bottom and that the feeble planners were in the pay of the developers. Gilligan’s tactic was to dig up dirt wherever he could find it. His point seemed to be that Britain’s housebuilders are useless, greedy and corrupt, whilst their political masters are stupid and naïve. As essays go, it hung together well, and made for compelling viewing. It is just that his basic premise was a little lazy. It’s all very well reducing the debate down to a reworking of the old 70s Marxist them’n’us routines, it’s just that reality has an annoying habit of being a whole lot more complex to understand. There is a very different story waiting to be heard from the housebuilders, but you won’t ever come across it on Dispatches. The best contribution to the show came from Paul Finch, once editor of the Architects Journal, now a CABE commisioner, who pointed out that the big problem here is that the government has abdicated responsibility for affordable housing to the private housebuilders. It is something this blog has touched on recently too: we are in unknown territory here. Gilligan didn’t concern himself with these niceties; nor did he stop to question whether an affordable housing programme was the correct solution to our current problems, which is strange because he wrote a thoughtful piece about this in the Evening Standard recently, questioning the assumption that we can build our way out of our housing problems. His sole interest in this programme seemed to be to bash the housebuilders. At the end of the show, the landbank issue was raised: you could spend a whole hour on this topic alone and still not get to the bottom of it. Kelvin Macdonald of the RTPI was interviewed and tried to give a reasoned assessment of the issues involved, but Gilligan simply didn’t want to hear it and concluded the interview with the statement that builders are deliberately holding back land in order to keep prices high. As they say, never let the truth get in the way of a good argument. I guess I am nitpicking. As a sometime builder, my hackles do still rise just a little every time the London media gets housebuilders in their sights. Because the result is always the same: a bloody televisual massacre. I suppose I shouldn’t be so sensitive; hunting housebuilders is good sport and, let’s face it, they are so thick-skinned that the odd bit of bad publicity never did any of them any harm. I don’t suppose Tony Pidgley even bothered to watch it, so I don’t see why I should get the hump. It’s just that halfway through Gilligan’s piece, I had the strong sensation that I had seen this same programme before several times over, and it was not the one I wanted to watch anymore. One of the many irksome features of an estate agent’s life is the vendor who apparently withdraws their property from the market, only to complete a private sale shortly afterwards with a purchaser who the agent had introduced. Most contracts expressly forbid such delinquent behaviour on the part of the vendors, at least for a significant time period, but it can be hard to enforce any penalty as the details of the house sale are kept private. It is estimated that anywhere between 1 in 10 and 1 in 4 withdrawn properties go on to complete the deal privately, thus denying the estate agent their contracted fee. Now the Land Registry is offering a service specifically aimed at estate agents wanting to keep tabs on what happens to withdrawn sales. For a small monitoring fee, the Land Registry will contact the estate agents with details of completed sales on their withdrawn properties. If the contract terms have been breached, the agent will then have a relatively easy task to reclaim their fee. If you want to know more about this scheme, contact David Lockett at the Land Registry in Coventry. Picked up this intriguing snippet from someone who works for Sheffield Insulation, our largest supplier of insulation for the construction industry. He said that insulation sales were up by about 5% as a result of the changes brought about in 2006 by Part L revision. In theory, they should have increased by a lot more. Also on a similar theme, a prominent boiler manufacturer tells me that sales of non-condensing boilers, which should have been kicked into touch for all time by Part L changes, are in fact holding up well. Many installers are still quite happy to fit whatever the householder wants. As far as the replacement boiler market is concerned, Part L compliance is optional, as there is no way of enforcing it. If you are anything like me, you will feel no excitement at all at the prospect of having to read yet another government initiative on housing. You sort of know what’s going to be in them and the prospect of wading through 130-odd pages of badly written, self-congratulatory twaddle is enough to make any grown man groan. I’m no different. We are going to hear a lot in the next few days about Affordable Housing. It’s at the very centre of the government’s agenda for the future of housebuilding in the UK, as set out in the Green Paper. It sounds like a vaguely worthwhile concept but when you get down to examining the details, the whole concept is littered with inconsistencies and problems. Take the very word affordable. What does it mean? Behind it lies a wider idea that housing generally has become unaffordable to all but the richest sectors of society; this is pretty much self-evident to anyone living in the South-east of England at the moment. But just what should be done about it? There are lots of policy options out there from doing nothing right through to nationalising all land. Somewhere in between these two extremes are many tax incentives and/or penalties which could be used to make home ownership more or less attractive. The government’s chosen response is to push for more subsidised housing (with the subsidies coming from the developer’s profits, not taxpayers’ money). But is it right to build a subsidised housing sector at all? We’ve been here before and it didn’t work too well last time. Subsidised housing adds to the social divide and makes another one of the government’s key objectives, social mobility, even less likely. There are other options. In egalitarian Sweden, they don’t have any social housing: instead, they subsidise rents for people in housing need. This way they neatly avoid building ghettos of housing for the poor. There is another problem that has so far not been discussed, as far as I am aware. Affordable housing schemes are largely financed by money taken from the theoretical profits made by developers on their private market housebuilding activities. This is governed by the so-called Section 106 agreements, the bane of every housebuilder’s life. However, it follows that the very existence of our affordable housebuilding programme has now become dependent on there being lots and lots of new unaffordable housing. And the more expensive it gets, the better it is for the affordable housing sector, because more profit can be creamed off from the housebuilders. Thus we are creating a paradox similar in many ways to the government’s stance on drinking and smoking. Whilst we are constantly being told what grief these awful habits cause, the NHS itself is hooked on their tax revenues. So it is with social housing. Whilst the government and the local authorities keep saying something must be done about the affordability crisis, they now have a vested interest in keeping ordinary housing unaffordable, because that’s the only way they can deliver affordable homes. The whole housebuilding sector is slowly becoming a sham, a modern day version of Robin Hood economics. First make the rich even richer by restricting the supply of building land; then rob them blind to build homes for the poor. Like many aspects of building physics, vapour diffusion first became the subject of academic study because there was a problem that needed both an explanation and a solution. The story is told in fascinating detail in William Rose’s book Moisture in Buildings. The problem was first noticed in the 1930s by American house painters engaged on painting the external timber claddings, or sidings as they call them, which were and still are so prevalent there. They reckoned that they were getting more problems and more call backs on jobs where the walls had been insulated. Ergo, there was something about adding insulation to the walls that was causing the paint on the wall sidings to peel, crack or whatever. Now, in the 1930s, placing insulation in walls was a relatively new idea and the businesses making insulation were keen to see that this new business venture wasn’t killed off by complaints from painters before it had got going. So they set out to investigate. The obvious conclusion would have been that the insulation had the effect of making the external face of the walls colder, because less heat was coming through from the house, and that the timber claddings would be therefore be subject to more frosts and more dew, and these actions would combine to shorten the life of any paint treatment. In other words, the building scientists had already created a model for walls where the heat was shown being conducted through the wall, and drawn diagrams of how the temperature gradients were likely to look through a wall. Now they could do the same thing with vapour pressure. 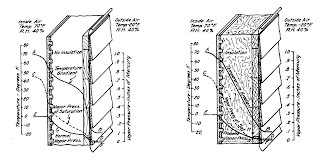 In 1938, Rowley produced a seminal paper which drew both a temperature gradient and a vapour pressure gradient through a wall section. He then went on to carry out tests in laboratory wall assemblies, funded by the US Mineral Wool Association. Rowley was able to demonstrate in his climate chamber that vapour diffusion was taking place and that, critically, condensation could also occur if the conditions allowed. How closely his climate chamber reflected what actually happens inside houses is a matter of debate: for one thing, Rowley took great pains to eliminate the effects of both radiant and convective heat transfer, because the whole theory rested on comparing the rates of heat conduction with vapour pressure. Rowley’s conclusion was that the problems that the house painters had been experiencing with wet claddings could be eliminated by stopping vapour diffusing into the wall assemblies. The story is eerily reminiscent of the recent debates about the testing of multifoils. When the multifoil manufacturers test, they get a positive result: when the competition tests, the results are negative. Back in the 1930s, there was no competition and the results of Rowley’s theories and tests became enshrined in the building codes throughout the world. The fact that his research was being funded by insulation manufacturers, who had a vested interest in its outcome, was overlooked. Because Rowley had unearthed a mathematical model for how moisture would behave in a wall, the chances of condensation occurring could now be calculated according to a formula including internal and external conditions, and the permeability of the materials. In essence, the conclusion of his work was that the damaging effects of moisture build-up in walls would be eliminated if a vapour barrier was fitted on the warm side of the wall. The fact that his initial experiments were carried out in conditions very different to the typical house wall was ignored. In testing for vapour diffusion, he deliberately eliminated the effects of heat transfer by convection, radiation and air movements. He was also only measuring the airborne water vapour in the air: the far bigger reservoir of bound water in the materials was overlooked, possibly because it wasn’t generally understood at the time. Yet this analysis of how we should build timber framed wall and roof assemblies still lies at the heart of our building codes. BS5250 is the relevant standard which informs our building regulations and its Condensation Risk Analysis, which it suggests is carried out on timber frames structures, is still in essence the same calculation which Frank Rowley worked out in 1938. Despite there being a huge amount of work out there now which contradicts Rowley’s original research, the profile method, and the resulting use of the vapour barrier, are still seen as essential components of good building practice. The fact that the profile method is nearly irrelevant can be demonstrated by a simple experiment, as described by Rose. Take two sealed jamjars. The first is left empty, the second has a small piece of wood placed in it, about the size of an ice cube. Sensors are placed in the jamjars measuring both temperature and relative humidity. The jamjars are then gently heated. In the first jam jar, just as you would anticipate, the relative humidity level falls because the amount of water vapour present is unchanged but warmer air is capable of carrying more water vapour. The second jam jar sees a very different result: the relative humidity level increases. Why? Because bound water present in the timber is driven out by the higher temperature. It is a simple demonstration that shows just why the traditional view of how water vapour behaves inside a house is misguided. The American building science community is at long last getting code-making bodies like ASHRAE to take on board the study of moisture loading and to allow calculations of safety levels for this new approach to moisture management. In the UK, the expert on these issues is Chris Saunders, who works at Glasgow Caledonian University. He authored an interesting paper for the BRE on moisture modelling in buildings (IP2/05) where he points out the inadequacies of the traditional Condensation Risk Analysis. The problem, from a practitioner’s point of view, is that what actually goes on inside a wall assembly is far more complex than the profile method makes out, and this does nothing to make modelling any simpler. There are some more sophisticated predictive models around which take into account air movement, porosity, water sorption coefficients and other factors, but they don’t always give clear answers and sometimes, in the case of many timber frame wall designs, the answers are not so very different from the original profile method answers. So although we now know a lot more about the workings of water vapour in buildings, it hasn’t made their design any easier. In particular, just the role of the vapour barrier is cast into doubt, the requirement for effective air barriers has come into focus. Vapour barriers? Air barriers? Are they really so different? It would appear not. The basic routine for both is polythene sheeting, placed directly behind the plasterboard, only an air barrier has to be far more carefully constructed than a vapour barrier. Whilst we can now see that Rowley’s vapour diffusion theories were misguided, it doesn’t appear that it is going to make a huge difference to the way we construct timber frame walls and roofs. 153 days. That’s what it’s taken us to put a planning application together for our new house, pictured here. If that seems like a long time, I would hazard that it is much longer than most people spend on it. In fact, when Oliver Rehm, the architect who heads up the Baufritz UK operation, signed us up for their design service back in February, he thought that we could have completed the design side in a month. The fact that is has taken so much longer is largely down to our prevarications and to a feeling that we really don’t want to start changing our minds after the application has gone in. Having been telling people not to for so long, now I have been hoist by my own petard. The deal so far is that Baufritz are charging us £6,000 for the design work. If and when we get a successful planning permission sorted, we then negotiate Part Two of the contract, which is the build. In fact, there is no obligation to go with Baufritz for Part Two, but it would in all likelihood take some sort of falling out for us to part at this point. This aspect of building a prefabricated German house is surprisingly daunting: the fact that you have to make gob-smackingly large financial decisions at the outset is just a bit frightening. It’s not quite like buying an expensive car when you can compare the prices between showrooms: a one-off house is just not like that. All we really had to go by was that the ballpark figure Baufritz had quoted at us was £1500/m2 internal floor area, not including foundations. I needed to see if this figure did actually transfer across to the house we have designed — and designed quite deliberately to be simple and easy to build. When Oliver produced a 32-page costing file with a total almost exactly around this figure, base on the designs we had agreed, then one of my main fears was allayed. Now I don’t know whether Baufritz will be able to hang onto this £1500/m2 figure for long: timber prices are rising for the first time in my lifetime, it would seem, and Baufritz houses are mostly timber. But I think it shows that they are a good bunch of people to deal with. In fact I knew that from the moment I first met them last year, but it’s always nice to have your first impressions confirmed. That’s not to say there haven’t been one or two hiccups along the way. 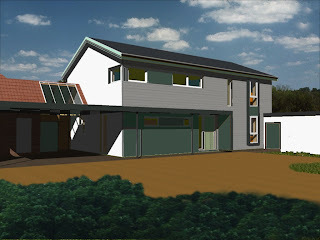 I am still holding fire on their claims to be building Carbon Positive houses: they have shown me their calculations and I think they are conveniently missing off the carbon contributions from items that they don’t supply, principally loads of concrete going into the foundations. And it’s not at all clear to me that carbon captured inside timber (which is the basis of their carbon positive claims) has really been sequestered. More like held captive for the duration of the life of the house. But the claim certainly has some merit, if only in that it gets you thinking about the carbon footprint of something as large as a new house. I was also surprised to see that the standard roof panels are only 200mm thick, as compared with the 400mm thickness of the wall panels. This makes quite a difference to the U values. Whereas the wall scores as low as 0.16, down at Passive House levels, the roof is 0.22, which barely scrapes through our current building regulations. For something selling itself on being a low energy house, this seems an unlikely oversight. Baufritz offer an upgrade, adding more insulation to bring the roof U value down to 0.16, but this is charged as an extra. But these are quibbles. Overall I am still delighted with the service we have received thus far and the standard of the product that they deliver. As well as having now visited their factory and showhouse in Germany twice, I have seen their first UK house being erected in Cornwall, as well as having been shown around the showhouse they built at the Grand Designs show last month. So I am bit-by-bit getting familiar with the whole process and the product they make. And the 153 days it has taken so far? What Oliver said to us back in February was that we could have a completed house to move into 32 weeks after we have obtained planning permission. That’s amazingly quick, by anybodies standards, and, as we don’t really want to be moving in till summer 2008, there hasn’t been a load of angst about “hurrying on” and “getting started” which I know bedevils most British selfbuilds. So we’ve taken our time, gone through no less than five versions of how the house might look and tried to think through all the different options before submitting plans. It’s still a very difficult process, because you can really only ever go so far with plans and computer animations: you have to take a leap of faith that everything will be alright and I know from experience that it never quite is. But I think it’s been 153 days well spent so far. As part of its widespread review of our energy saving strategy, the government published a paper in November 2006 called the Review of Sustainability of Existing Buildings. It’s a critical issue both for national policy and for the homeowner seeking to reduce their fuel bills and their carbon footprint. Buried within this document is a table, which lists 13 energy saving measures that can be carried out on existing homes, together with a breakdown of costs, payback periods and energy saving potential. It makes startling reading for anyone considering a house renovation. 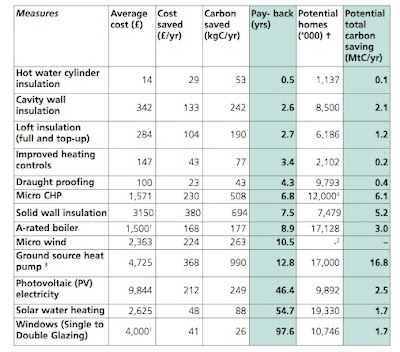 The most effective measure is listed as providing insulation for your hot water cylinder, at a cost of just £14 and an annual saving of £29: in contrast, the least effective thing you can do is switch from single glazing to double glazing, something which will cost you around £4,000 and will only save £41 a year. However, as a guide to what to do, this table is horribly flawed and contains a number of glaring errors. The single worst of which is that the savings suggested are not cumulative: if you added together a basket of measures you might take to refurbish a house, the savings appearing in this table come to more than the total energy usage of the house before any renovation has taken place. Clearly that is a nonsense. For instance, whilst installing an A-rated boiler might just save you £168 a year if you took no other energy saving measures at all, this saving reduces dramatically when you insulate the loft, the walls, fit double glazing and draft proofing, not to mention providing a hot water cylinder with an insulated jacket. Whilst this might appear to be blindingly obvious, it appears to have escaped the attention of the authors of this report, who use this saving rate to calculate the potential for energy saving throughout the whole country, simply by multiplying the potential saving in each home by the number of homes without A-rated boilers, some 17 million. It gets worse. There are some frankly unbelievable figures in here. The amount of saving from solid wall insulation (as opposed to cavity wall filling) is down at £380 a year. Seeing as the average gas bill for an average house (which this is supposed to be modelled on) is between £500 and £600 a year, which includes heating domestic hot water and cooking, as well a boiler loses (by not having that A-rated boiler, estimated at around £168, remember), they are claiming that you will virtually eliminate your space heating bills by applying solid wall insulation around your house. Writing as someone who once did this exercise, I can assure you that this will not happen! The micro wind turbine appears in the table with a saving of £224 a year. I have no idea where this figure comes: even the very generous estimates provided to us by the manufacturers don’t suggest that a wind turbine can provide more than 1,000kWh of electricity a year, which is worth about £120 (if you have a particularly penal tariff!). Actual returns from micro wind turbines fitted are coming in at far less than this: indeed several have been fitted thus far that have yet to produce any electricity at all. So how the table manages to come up with a 10.5 year payback I have no idea. It’s not much better with photovoltaic solar panels. The table suggest that for an outlay of £9844 (before grants), you can hope to make a saving of £212. That sort of money will buy you nearly 10m2 of panels which should, if you are lucky, produce around 1,000kWh per annum. To buy this at 9p/kWh would cost you £90, so unless you are buying electricity at a whopping 21.2p per hour it’s hard to see how you would obtain a saving of £212. The ground source heat pump example isn’t any better. For a start, they are not really recommended in properties that aren’t already heavily insulated and have comparatively low heating demand, ideally delivered by underfloor heating. It’s not something you should consider powering a house with no loft insulation, no wall insulation and single glazing. No way. But the authors of this report are suggesting that it could be used in 17 million homes (that’s every one with a garden) and that it could save a tonne of carbon emissions in each one, saving the residents £368 on their gas bills. Phoey. Whilst ground source heat pumps have their place, and may reduce gas bills substantially, they do it by racking up rather large electricity bills instead (especially in uninsulated homes!). This seems to have completely escaped the report writers. So please handle this information with care. I know it’s not intended to be guidance for the individual homeowner, but if it was accurate there is no reason why it shouldn’t be used as such. But it’s not accurate. Not at all. If that’s the standard of the advice the government is getting about this issue, then heaven help them in their drive towards a low carbon economy. When I last wrote about Polish bulders, it was mostly in glowing terms. However, I did add a warning note: Doubtless there will be a few Polish rip-off merchants and quite a few useless Polish builders, just as there are with all ethnic groups, in all walks of life. As if to bear this out, an unhappy story comes to my attention today, also emanating from Edinburgh, although I think this is just co-incidence. The moral is this. Don’t suspend all your critical faculties just because the builder comes from Poland and looks to be cheap. Not everyone born in Poland is a saint. And, despite what my previous story was advocating, try not to pay cash upfront. I know it’s easier said than done, but most building horror stories have the phrase cash upfront somewhere in the telling of the tale.